RAFT celebrated the Chinese New Year last weekend with over 250 members participating in this fun event. Lucia Quaife, long time RAFT Member has been the backbone of this event, bringing it to life for the past six years. The Year of the Dragon festivities started with master calligrapher Richard Zhao who created beautiful dragon zodiac symbols and other good luck signs traditional in Chinese culture. Keeping with the theme, another RAFT member, Tsen-wu Pang created a magnificent Dragon costume that is still on display in the RAFT San Jose Member Center. 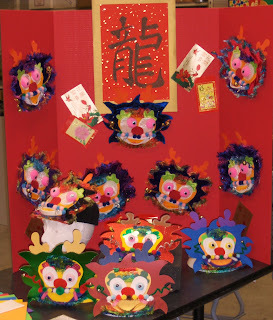 She also demonstrated how to make dragon masks using foam, fabric, corrugated paper and many other RAFT materials. Quaife, an educator at the Creative Learning Foundation, a non-profit providing practical Mandarin teaching to non-Chinese-heritage children in the Bay Area, along with her staff, taught members how to make their own healthy and delicious spring rolls. This light refreshment can easily be duplicated in a classroom without the worry of cooking in class! A RAFT enthusiast, Quaife also demonstrated various innovative, simple, hands-on paper crafts including an almost real version of the firecracker using red paper, lanterns and dragons using corks, tubes, cylindrical foam, gold foil, chenille stems, pony beads and cupcake paper holders. The day culminated with the amazing sounds of the Chinese zither (Guzheng) played by 3 local high schools students. At this event, RAFT members got to dabble in calligraphy, paper crafts, cooking spring rolls, eating Chinese fare and they even got to take home some of the hands-on activities they worked on!